Gerry is asked to be the flower girl in Aunt Sue’s wedding, and she couldn’t be more excited. Her imagination runs wild with thoughts of extravagant decorations, a billowy white gown, and hundreds of guests. When she finds out the bride prefers a small celebration, Gerry can’t help but be disappointed… but she soon realizes that having the wedding in her own backyard will let her put her creative stamp on everything. Even when disaster strikes in the form of rain on the big day, Gerry finds a way to bring sunshine to the party, reminding everyone that the most important thing at a wedding is the most special sparkle of all – happiness and love. 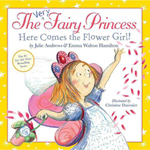 Christine Davenier’s whimsically elegant illustrations include lush garden scenes and plenty of wedding flowers in this spirited follow-up to The Very Fairy Princess and The Very Fairy Princess Takes the Stage.